This collection consists of 20 issues of the Verordnungsblatt des Militärbefehlshabers in Belgien und Nordfrankreich, containing the anti-Jewish measures ordained in Belgium, including: legislation on ritual slaughter, determining who is Jewish, the municipal registration of Jews as of the age of 15, the registration and marking of Jewish shops and restaurants with placards, the exclusions of Jews from certain professions (government, educational, press, judicial and later medical professions), the residency restrictions (curfew and relocation sites in Belgium), the creation of the Association of Jews in Belgium, the ban on travelling abroad, the expulsion of Jewish pupils from non-Jewish schools, the compulsory employment for the Jewish unemployed, the confiscation of Jewish property by the German Reich and the wearing of the yellow badge. The collection of Samuel Polak (forthcoming) also contains two volumes of the Verordnungsblatt des Militärbefehlshabers in Belgien und Nordfrankreich. After the Belgian capitulation on 28 May 1940, Hitler established a Military Administration for Belgium and Northern France. This interim occupation authority was led by Alexander von Falkenhausen from its establishment until July 1944, although as of Autumn 1942 the SS tried to obtain the instalment of a civil administration due to rivalry between several German organisations. On 18 July 1944, the Military Administration was replaced by a civil administration under the rule of Gauleiter Josef Grohé who became the Reichskommissar of the Reichskommissariat Belgien und Nordfrankreich. The Reichskommissariat exited from 6 weeks before Belgium was liberated in September 1944. 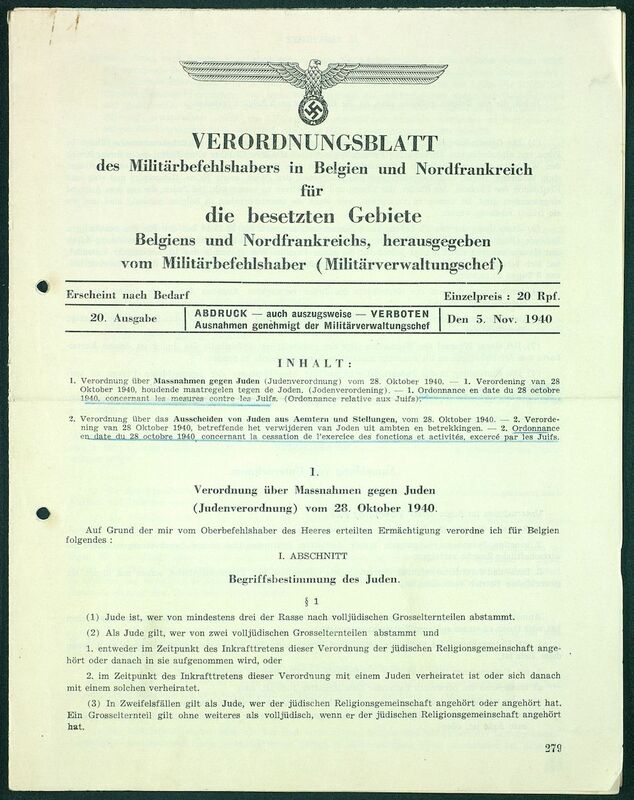 The Militärbefehlshaber in Belgien und Nordfrankreich was responsible for the publication of all ordinances in force in Belgium and northern France (Nord and Pas-de-Calais provinces) in the Verordnungsblatt, the official state gazette under the German occupation. The booklets were published regularly and contained all types of legislation, including anti-Jewish measures.